Spring may have taken its time this year, but the sun is shining, the trees are finally starting to bloom, and this means one thing–it’s officially ice cream season. 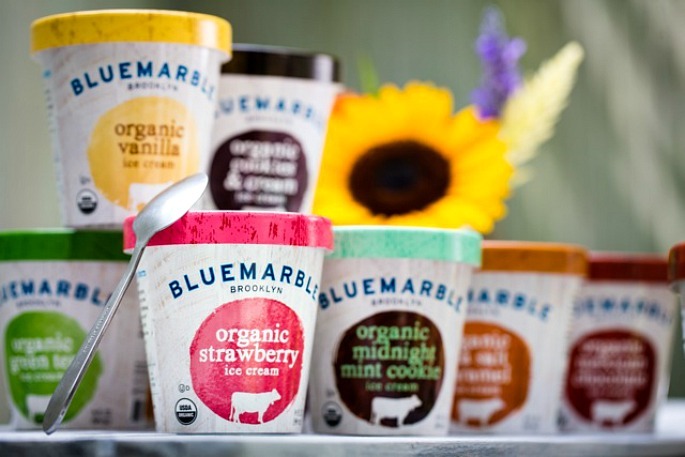 If you’re looking for the perfect local scoop, which also happens to be consciously sourced and organic, then you might just stop by Blue Marble Ice Cream’s Cobble Hill or Prospect Heights shops or pick up one of their pints on your next grocery store trip. Blue Marble Ice Cream was co-founded in 2007 by former roommates turned entrepreneurs Jennie Dundas and Alexis Gallivan. For Jennie and Alexis, who originally connected on Craiglist, a love of ice cream inspired them to open a scoop shop. And while neither had a business background, they were determined and opened up in Brooklyn. Fast forward several years, and Blue Marble is ready to expand nationwide after being picked up by a number of major supermarket chains. On a local scale, they’re part of a wave of businesses helping to transform Industry City in Sunset Park, Brooklyn, something of which the company is extremely proud. 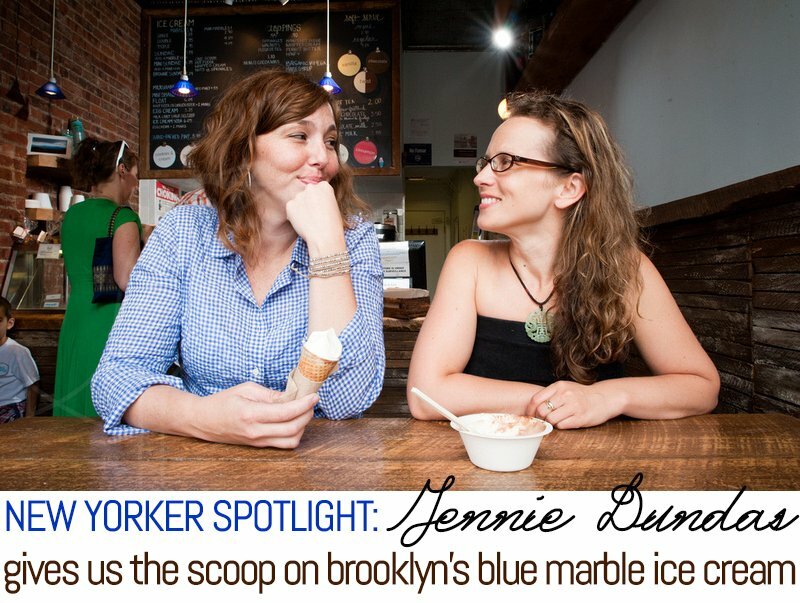 We recently spoke with Jennie to get the scoop on Blue Marble’s founding, its headquarters in Industry City, and of course, to find out why ice cream is everyone’s favorite warm-weather (or year-round!) treat. First off, why do you think people love ice cream so much, other than it being delicious of course? Ice cream is multi-generational, it inspires nostalgia, it’s sensual, indulgent and wholesome. The hipsters can love it, grandmas and grandpas can love it and two-year-olds can love it. It’s something that’s innocent and takes you back to that place in childhood that you never lose your appetite for. What inspired you and Alexis to get into the ice cream business? We felt there was a void in the marketplace in New York City. There was exquisite gelato on the Bowery, but not a lot of gourmet ice cream. 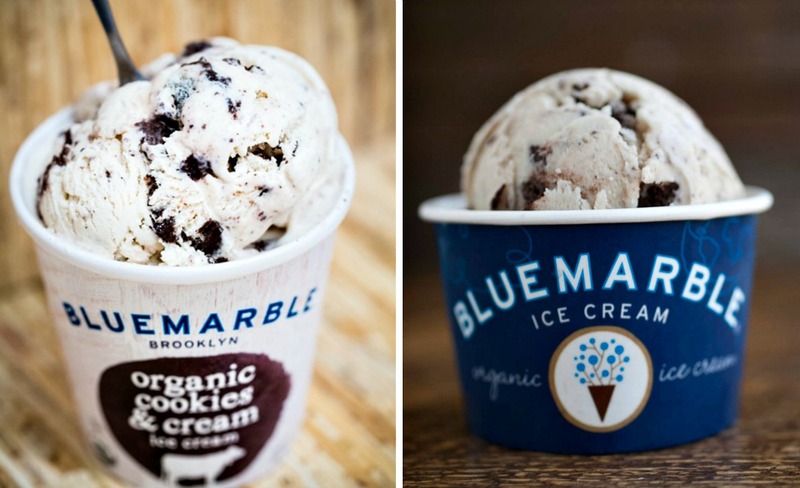 In Brooklyn of all places, where it was such a burgeoning scene of people who cared about ingredient sourcing, there wasn’t really a place to get consciously sourced ice cream. We saw a great opportunity, but neither of us had business backgrounds. What inspired us to make a good business decision when we had never made one? We were both really passionate about ice cream. We love it. I think we both love the spirit of ice cream. We just came together in a moment of inspiration. Did either of you have experience making ice cream? No, we were just passionate about eating ice cream. Literally, there was one time Alexis called me and said, “We have to get ice cream.” She lived downtown at this point in the far West Village and I was in Morningside Heights. I think she drove and picked me up and took me to Midtown to Cold Stone Creamery. She double parked on 42nd Street while I ran in. What’s the story behind the name Blue Marble? Alexis had been interested in opening a language learning center for underprivileged kids where they could explore other cultures through language. She came up with the name Blue Marble because it’s related to learning about Earth, the big blue marble. She scrapped the idea, and when we thought about the ice cream shop, it kind of resurfaced as a great name because not only are we sourcing from all around the world, but we want the kids who come in to be conscious that ice cream doesn’t just pop out of the freezer. It comes from this combination of ingredients from all over the world, and this is how we respect the farmers. But also, it’s cold, and there is this image of a round thing. We thought we could call the scoops marbles. If you come to our shop, you order a marble or a double marble. We just thought the whole thing worked out really well. You’re literally calling it a marble and you’re biting into it and eating a piece of the earth. The company is based in Brooklyn. What drew you to the borough? There’s no limit to my gratitude for the borough of Brooklyn as a place where we were able to launch our business. At the time, we started in Brooklyn because Alexis was living here and you could find a place for decent rent. In retrospect, and with more experience under my belt, I can see that it’s not just random that all these businesses have been able to incubate and come out of Brooklyn. The community here is supportive and loyal. People are very passionate about their food and their products. Brooklyn is key to what we have built. Your first store was in Boerum Hill. Why did you select this neighborhood? 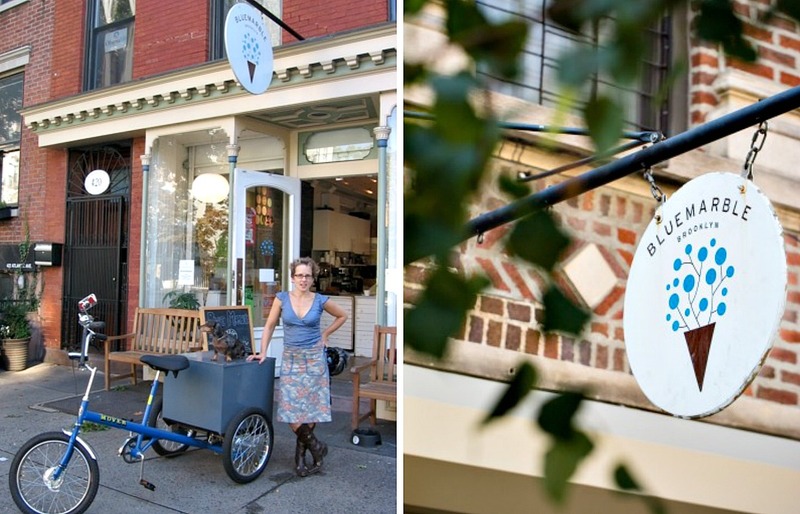 We were looking in Cobble Hill and we found a perfect little spot next door in Boerum Hill. I remember our graphic designer rode by on her bike and said, “I found the cutest little place with windows. You should check it out.” You always kind of have a certain image of what you want in a location, but you’re really subject to the real estate market and what’s available. When it came time to open a headquarters, you selected Industry City in Sunset Park. How did you choose this up-and-coming location? Well, we were growing very rapidly with our wholesale division and we realized we needed more than an office; we also needed a manufacturing and distribution center. We looked at a bunch of places. I started to see into the future. Where are the trucks going to pull up? We’re going to have to come out to the door with a fork lift. I started to feel really strongly that the key to our success would be having a loading dock. I have a friend who is a sculptor, and he was one of the artists at Industry City for quite a few years. He had a massive space in one of the buildings, and he and his wife were encouraging me to check it out. I had never heard of it; it sounded like Mars. He said, “It’s really not that far. It’s one stop from the Atlantic Center on the train.” I went to visit, and it took me ten minutes to get there from our then office on Dean Street. We moved there in 2011. What’s exciting to me is that we were the first tenants on the ground floor of building two on 36th street, which is now really a main hub. 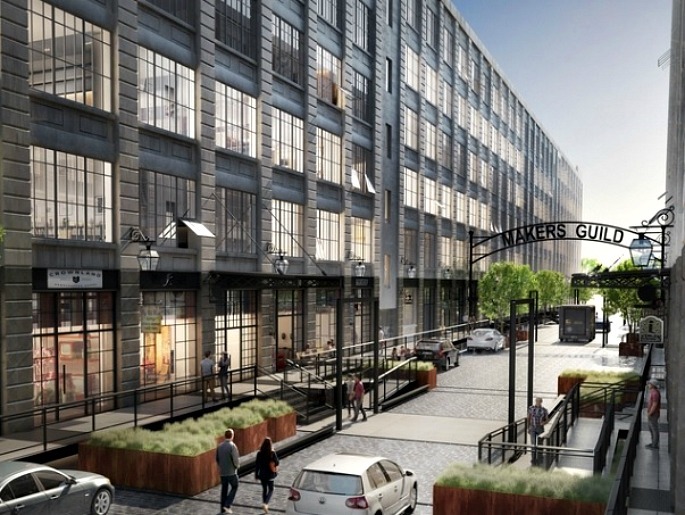 Industry City is calling it their food hall. There was nothing in it when we moved there, not even walls. Before Jamestown took over the property, they were looking for tenants like us. They had a vision of it being a food hall, a kind of retail and manufacturing hub. It was a little bit of a once-in-a-lifetime opportunity in real estate to have rental space that you could create, and it was right in the heart of our business. They have been an incredible partner to us. I’m very grateful to them. You’ve had the chance to watch the development and innovation taking place in and around Industry City. What have you noticed about the transformation of the Sunset Park waterfront? I think that the development has been awesome. When we were first there, it was like a ghost town, and that was only four years ago. Now, when I go to work and the doors open at 36th street, there are droves of people getting off the train to head to work. The Barclays Center has really impacted development along 4th Avenue between the venue and Industry City at 36th Street. [Editors note: Blue Marble has a stand at the Barclays Center] I’m really proud to be part of the development at Industry City because for me, it’s been an incredibly supportive incubator for our small business. It’s really allowed us to thrive and grow in a partnership with a landlord, which is very important. The company has clearly grown by leaps and bounds since 2007. What are the biggest accomplishments? We’re at a point where all the blood, sweat and tears are starting to show the results of this great product that merits national and even international recognition. It’s a great feeling, and I am utterly proud that the product came from Brooklyn. I can’t even begin to describe the journey from then to now. We were the first ice cream company on the east coast to serve ice cream in biodegradable containers, and now everybody does it. I’m proud that we kind of lead the way on that front. We’re poised for a national launch of our 14-ounce pints, which I feel has been a long time coming and is very momentous for us. We started as a tiny little scoop shop in Brooklyn by two women who had no business background, and seven years later our product is being sold in Central Market in Texas; we just got into A&P, Pathmark, and Food Emporium, and we just started working with a distributor in Mexico. We’re also going to be opening a retail window at Industry City. It’s probably a couple of months out, but it will be part of the food hall there. People can come and see the ice cream being made and then buy some. Can you give us the scoop on any flavors in the works? We recently launched three new pints: a butter pecan that is really divine for people who like the flavor; a Mexican chocolate that is a really warm, but not spicy; and our ode to the Girl Scouts’ Thin Mint cookie, midnight mint cookie. If you could select one Blue Mable flavor that epitomizes New York, which one would it be? New York is so incredibly diverse. Our sea salt caramel is really slamming. It’s got the sweet, the salty, the butter, it’s sophisticated, it’s just divinely smooth. So maybe in that sense I would pick that flavor. What does sharing the joy of ice cream with New Yorkers mean to you? New York is a place where a lot of people start out and it’s always been their home, and then there are a lot people who started out somewhere else, whether another US city or another country, and now New York is their home. I feel that ice cream is a great unifier. Seeing the diversity of our customer base, which I’m so proud of, I want everyone to feel at home at Blue Marble.